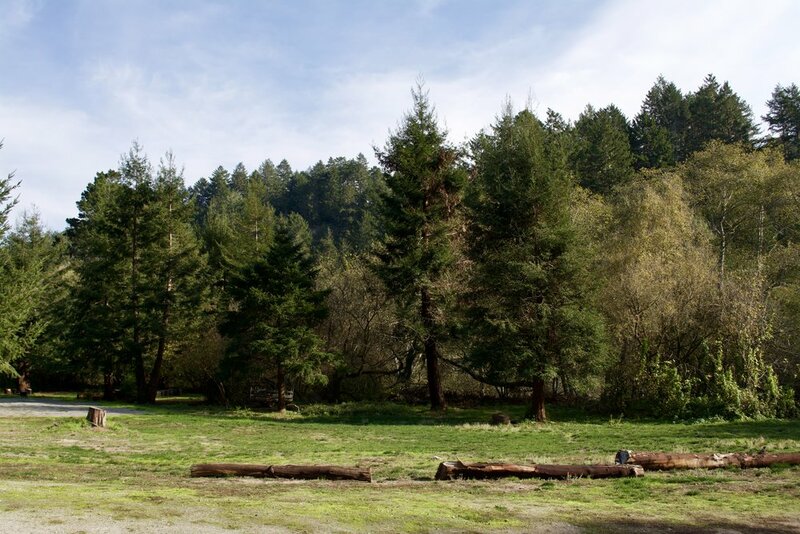 The camping meadow is a clearing surrounded by the santa cruz mountains and trees. The perfect spot for stargazing on a clear night and enjoying the campfire circle. Accomodates up to 15 small/medium tents. Space may also be used for RV/camper parking. The camping meadow is directly in front of the lodge and provides easy access to lodge facilities and restrooms. In addition, outdoor showers behind the cabin are available to camping guests. The camping meadow may be booked as an add-on to the lodge. Additional camping areas may be available behind and adjacent to the lodge for larger special event groups. The meadow provides plenty of room for camping, and/or group activities and games such as volleyball, corn hole, or community-building activities. The fire circle is the perfect gathering spot to hang out and relax at the end of the day. Kick back in front of a cozy campfire, tell stories, play some music, and enjoy your s'mores! Bordered by trees, and just up the hill from Butano Creek, the meadow provides an area for connecting with nature and those around you. Settle in and enjoy the views!